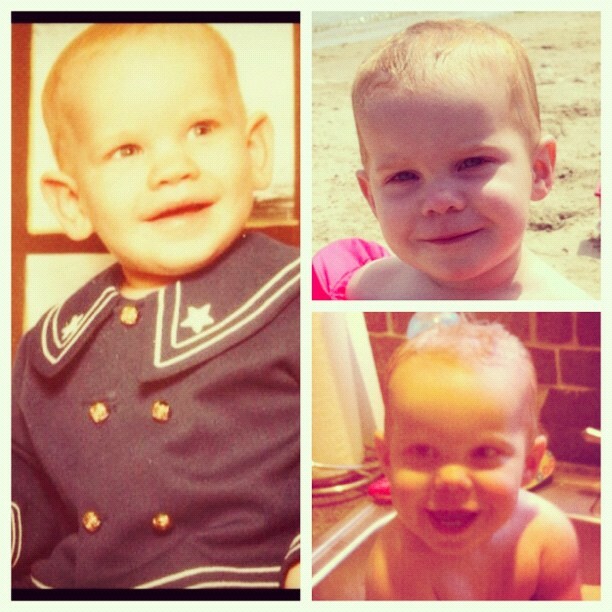 Jeremy in the sailor suit, and his other mini-me, Carter bearing the same sweet features. Now the school is in full swing and we've kinda (and I use that term loosely) got a routine going, I've been able to spend a lot of one-on-one time with my man cub. I haven't had just one child with me in over 5 years! It's been nice to just play with him, talk to him, and watch him grow. His life thus far seems to have gone by in the blink of an eye and I know I was checked out for the first part of it. I feel like I've missed a lot. Spending more time with him has made me face a lot of grief associated with his life, though. Watching him learn new things and knowing that Jeremy will never get to see him grow. The ache that comes with the understanding that Jeremy never got to hold his son. Thinking about the day he was born never ceases to make me emotional. Sometimes I think that day was harder in some ways than the day Jeremy died. We talk about 'daddy' all the time - he associates my necklace with Jer, the pics of him around the house, the tattoo on my arm, even the Toronto Maple Leafs logo he recognizes with his daddy. It's so incredibly bittersweet. Last week, I sat down and showed Carter the video I have of Jeremy reading "Barnyard Dance" to Faith and Caleb. He was mesmerized. And I was full of tears and smiles. We went about our day and week until the other day, Carter was pointing to the table throwing a fit because I couldn't understand what he was wanting. When I finally figured out that he was pointing to my computer and saying "read Daddy, read Daddy" I burst into tears. Not only did he remember, he wanted more. More of his daddy. He wanted more of this presence he hears referred to all the time but hasn't met him or touched him yet. To hear his voice, see his face, and see him snuggle up against his big brother and sister made an impact on that little 19-month-old heart. He watched it again and again. For all the times I worry that Carter may not understand or I might share enough....I realize that Jeremy really is a presence in our hearts and in our lives. And he's in the heart and life of a little man cub who's never met him face to face, but who lives out his legacy as the spitting image of his daddy. My morning runs always seem to be my time where I figure out life's puzzles (or find more life questions to ask). There's something about that me time when I can reflect, pray, organize my thoughts, and focus on myself that is very centering. This morning I felt a little disappointed about the relationships in my life. With life changing so much in the last 6 months or so, I've noticed a lot of people stepping back. And I get it, I really do. My life stays so busy now with a house of seven. But I have not stopped needing any of those relationships in my life, or craving them. I know that since my life no longer qualifies as "tragic" and people assume I'm all "better" they've stopped calling, writing, commenting, coming around, or even talking about Jeremy. This breaks my heart, and makes grief harder. There are still those few people who are very dear to me who have been there for me when I need them, but overall I've noticed a change. The change is not only grief related. For whatever reason, I've had multiple friendships throughout my life that have dissipated due to elements out of my control or for reasons I didn't even know about. It's one of the hardest transitions to go through in relationships; feeling like you would do anything you can to fix/change/maintain the relationship, and it moves on without you. No matter how much I tried to distract myself with other things this morning during my run, my brain kept going back to that hurt and I kept wondering 'why do I bother letting people in so close if I always end up getting so hurt by it?' People I let close either die or leave. This was a hard reality to choke down today. But the truth I discovered this morning was that I keep seeking out and aching for those relationships because they're life-changing. Those relationships, whether short-term or long-term, have made me who I am and have taught me so much along the way. Sure, there's risk involved - that's true of any relationship. But the risk is worth it. 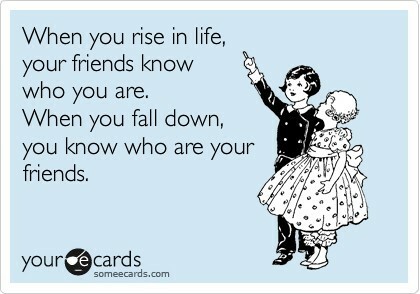 It's worth the risk to have a friend who can share life's burdens with you so you don't have to carry them yourself. It's worth the risk to have a relationship with someone who knows you're crazy and loves you anyway. I could safe-guard my heart and stay away from getting too close to people who could really hurt me. But then, how safe would that actually be when I am missing out on one of the biggest blessings in life? How safe would it actually be for me when I end up carrying all my baggage alone? A girl could get seriously hurt doing that. So, I'll stand by, waiting for transition to take its course and trying to remember that the risk is worth it. I will also continue to pray that I can embrace and invest in those special people in my life now and be a worthy risk for someone else. Steve and I are passionate about sharing in a ministry together to help those in grief. My experience and his education has given us a pretty unique combination of perspective and we feel like God has called us to do something with our story. We are in the beginning stages of trying to write a book (if anyone has any resources for us as far as editors and/or publishers go, please let us know! ), and we are excited to once again be speaking and running workshops at Camp Widow 2013. 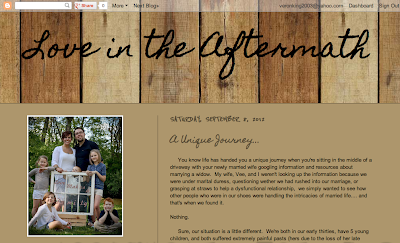 But today, I want to share Steve's new blog, Love in the Aftermath. I am super proud of my amazing husband for starting his own blog as a resource for those who love a widow/widower. We discovered that there aren't many things available out there as far as support goes for those who are dating a widow/er, or those married to a widow/er. So please, stop by there today, leave a comment of encouragement and support, and become a follower. God is moving. Thanks to all of you for your continued love and support to us both, for giving us purpose on this journey together. We wouldn't be here without you. I've mention that grief has been lurking around every corner lately. Not super intense, I am just very aware of it and it has made my heart heavy. I think the realization that I am coming up on two years in November is suddenly hitting me. Just like any other day on this widowed journey, it feels like yesterday and forever ago all at once. I start to hurt when it feels like Jeremy slips through my fingertips each passing day, further away from me. Then I look around at my life and realize how vastly different it looks now than when he died, and how different it would look now if he were still here. That makes him feel far away too. The fact that I still have and use his iPhone. The black shirt in Faith's drawer that she loves to wear cause Daddy picked it out for her. It still fits. The death certificate I just got back in the mail from the alarm system I cancelled. A worship set he scribbled down on a piece of paper. The smell of him that overwhelmed me when I went through his stuff in the basement this week. The Lady Antebellum CD that he picked out days before he died that was sitting on my desk. The video game of his that our nephew asked to play when he came to visit. The pamphlet for the 2nd annual Jeremy King Memorial Pheasant Hunt that will happen at the end of the month. The gestures, expressions, and smiles of our children. These are all marks of a great man. Not just a great man, my great man. And not just a distant man who lived long ago, but a guy who was JUST HERE. The marks he left in this world are still visible, still rippling through my life and through the lives of those he touched. The big things are there, no doubt, but what amazes me is all those little things. The details of simple day-to-day life don't just go away when you do, they carry on. They continue through those you care about, through stories, habits, rituals, memories, and love. Even though it can be painful, I'm in awe watching the ripple effect that Jeremy's life still makes. Not the deep defined ripples anymore, but they're visible; subtle, smooth, and steady. 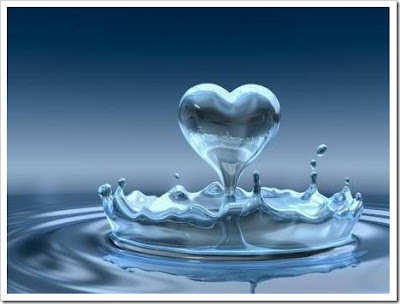 And I've realized that I myself have become a ripple in Jeremy's life and I carry the effect of it everywhere I go, forever.